Some larger-scale pecan growers in Georgia have been practicing hedging. Hedging is a practice in which the grower makes severe cuts to the tree to make it a little bit smaller than what it would normally be, which allows more sunlight to enter the orchard. Lenny Wells, an associate professor of horticulture and pecan specialist at the University of Georgia, is studying hedging to explore the benefits of the practice. He says that hedging has been done a lot in the West. “That’s pretty much how they grow the trees out there,” Wells says. Now, hedging is starting to catch on in the Southeast. According to Wells, lack of sunlight is one of the most limiting factors when growing pecan trees. During the growing season, growers deal with afternoon showers and frequent cloud cover. Furthermore, as the orchard grows, the trees begin to crowd each other, which limits sunlight even more. Hedging can help the orchard become more open, letting in more sunshine. 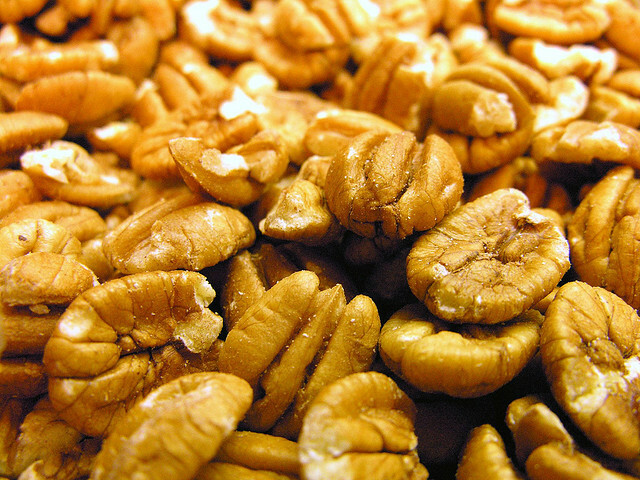 Lack of sunlight has been an ongoing problem for pecan growers. Before hedging became popular, growers would go into the orchard as it begins to crowd and remove a certain number of trees to make room for more sunlight. “This is actually kind of counter-intuitive to the way we think when that situation arises,” Wells says. Clearing out trees in the orchard produces higher yields because the amount of sunlight increases and there is less competition for resources among the remaining trees. However, hedging can accomplish these same things while keeping the orchard full. An additional benefit, according to Wells, is that by hedging the trees, growers can get better coverage with their fungicides and other materials they spray on the trees. Wells is in the third year of conducting a study that observes season-long water stress on hedged trees vs. unhedged trees. So far, he has consistently seen that hedged trees have less water stress than the unhedged trees. He says the reason the stress is lower is because the hedged trees are smaller. “They’ve got the same root system there, but less tree to feed. So, it relieves some of the stress on the tree,” he explains.